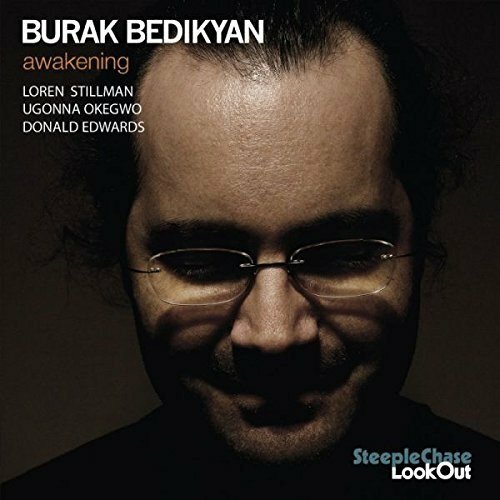 Turkish pianist, Bedikyan, has assembled another fine combo of stateside musicians for his third Steeplechase release. His front line running mate on this occasion is British born altoist Loren Stillman, a one-time pupil of Lee Konitz who has fully imbibed the old master’s capacity for invention, expressing it by way of an astringent timbre and self -assured flair that is all his own and well suited to negotiating the leader’s musical conception. All the pieces are composed and arranged by Bedikyan and build upon his previously expressed mission to imbue contemporary jazz idioms with the reflectiveness and romanticism of European and Near Eastern classical and ethnically flavoured forms. What emerges is rich in diversity but never far from the urgency and ingenuity that powers the distinctive spirit of the jazz ethos. Bedikyan opens with a powerful affirmation of contemporary post-bop jazz suffused with Big Apple attitude. He launches his piece `Idee Fixe` with powerful, pungent pedal chords which Stillman promptly leaps upon to fire up a theme of searing semi-tones with the pedal returning as a sort of spacer between solos and providing a structural foundation to the whole piece. This piece and a blues which demonstrates Burak’s idiomatic grasp of the fundamentals plus a storming, up-tempo hard bop closer, “All Seeing Eye” contrast effectively with the more contemplative music which give him scope to express the wider musical interests that are enshrined in both his melodic concepts and the improvisational substance that emerges from them. Like most pianists he acknowledges an indebtedness to Bach which he weds to an appreciation of modernists like Milhaud and Messiaen as well as his primary jazz influences, Corea and Hancock, and in uniting all these influences whilst stirring in some Phrygian exoticism, creates a synthesis that is both intellectually stimulating and profoundly moving. Pieces like the haunting “Mother Earth” and “Memory of A Fading Dream” summon up deep rooted yearnings associated with place, identity and memory whilst reaching out for new modes of expression occasioned by encounters with other cultures and life experiences. All these ideas he translates into music that is refreshingly original. First and fore-most this is, however, a modern jazz record and as such needs the support of a first class rhythm unit to give the music momentum and swing. Both Okegwo and Edwards fit the bill perfectly and provide the necessary propellant; the bass, rich and resonant; the drumming powerfully adroit offering solos packed with attention arresting detail and binding the various musical elements together in an unbroken percussive flow. Steeplechase has a long standing reputation for bringing sound boilerplate contemporary jazz to our attention whilst its `Lookout` imprint aims to introduce us to nascent talent worthy of note. I would say that with this release Burak Bedikyan needs to be elevated to the major league. We need no longer be on the lookout, he has well and truly arrived.